The Little Blue Heron, like most (all?) herons and egrets, flies with its neck bent and its head drawn in close to the body so that it sometimes appears neckless but always looks like a heron. Except sometimes they don’t. This was the downfall of an extremely competent New York City birder who recently saw a large wading bird fly by at a distance at Jamaica Bay with its neck extended. Excited by what he perceived as a Sandhill Crane, an exceptionally good bird anywhere in New York City, he rattled off a couple of long range shots and posted to the listserv about his find. Other birders, smelling blood, moved in for the kill and the bird was revealed to be a Little Blue Heron flying with its neck extended for some unknown reason. 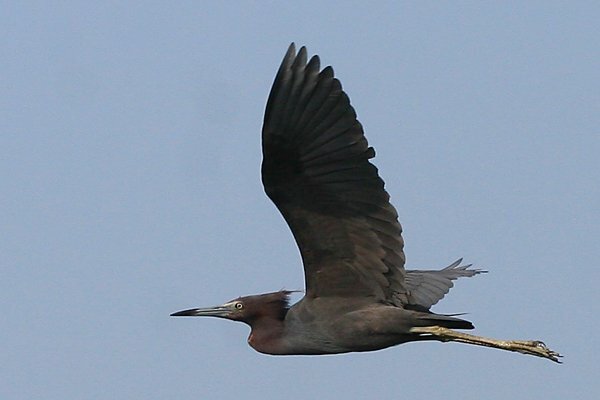 A Little Blue Heron flying as they normally do, with the neck bent and the head by the body. Now, herons and egrets are known to sometimes fly with their necks extended when they are landing, taking off, on a short flight, or stressed. But for a heron to be flying along for any distance with its neck extended is odd, which explains the identification error. 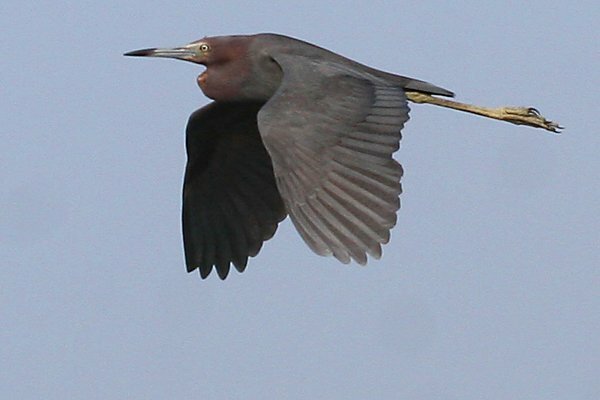 So you can imagine my surprise when, on a recent visit to Jamaica Bay, I too saw a Little Blue Heron fly past with its neck extended. It took me a full four or five seconds to figure out what I was seeing and the bird was out of sight by the time I thought to take a picture. I was extremely pleased to be given a second chance a week later and I didn’t blow this one. Observant birders will notice that the bird is pitched forward and looks like it might be heading in for a landing but it didn’t land and really didn’t look like it meant to. I spotted it flying over the West Pond from the south side of the pond and these shots were taken as it crossed the trail and headed over the south marsh and then curved east towards the East Pond. The entire time it was in sight, for at least thirty seconds but likely longer, it had its neck extended. Odd, no? So, birders, why is this happening? Is this just one bird with some kind of injury? Is this at all normal? Your thoughts? I’m not crazy for finding this weird, am I? I don’t know whether it is normal or common, but a few months ago I did see an egret flying over some nearby farmland like this and thought it was a bit of an unusual sight too. Hmmm, i took some photos of a “reddish egret” down on the Baja (Gonzaga Bay) this spring which look exactly like a Little Blue Heron. Does the Little Blue Heron dance around and flap it’s wings while fishing? Because the Reddish Egret really puts on quite a show… Are these the same bird? I’ve never seen a heron of any kind flying with its neck extended while in midair. It looks awkward, and could definitely lure me into making a wrong id. @Jonnel Little Blues and Reddish Egrets do have similarities, but only Reddish Egrets act staggeringly drunk when they are feeding. @Corey Yes, you are crazy. @crowbones and Carrie: Glad I’m not the only one! @Seagullsteve: But it is weird too, no? Yeah its definitely not typical, but you probably get to see a lot more Little Blues than I do. What I do know is that Im glad Im not the guy who reported one as a crane. I have seen Grey Herons fly with extended necks a few times here in Europe, so it does happen but it is very unusual. How unusual? Well, I might have seen it 5 times, and seen how many Grey Herons in flight? 100,000? More? In St Martin right now and seeing lots of snowy egrets, several flying with neck extended. I’ve never seen that before.…glad to read that others have seen herons doing the same thing, even if they can’t explain it.